Why the KSI Vs Logan Paul “Fight” is a Farce! The next few weeks and months are going to be expensive for boxing fans as it is, with several PPV shows lined up, all providing us with genuinely exciting and interesting match ups. These include the rematch between GGG and Canelo, as well as Joshua Vs Povetkin and Groves Vs Smith. However, one “fight” that seems to be drawing a lot of attention is that of one between two incredibly wealthy and well-known YouTubers – “KSI” and Logan Paul. Why is it a farce? 1) It’s a PPV event – there are world champions out there who don’t get fights on PPV despite dedicating their life to the sport. This fight will not be anywhere near professional standard, let alone world title standard; so why should people pay to stream it? 2) The ticket prices – The cheapest tickets are around £50, with regular floor seats going for £150. Pro’s on local shows here in the UK are selling standard tickets for £30/£35 and they get far less commission than these fighters will, despite operating at a significantly higher level. 3) It’s staged – anyone that knows boxing, will know that a lot of the drama surrounding fights is done to increase attention on a bout and draw in the viewers and the buyers. KSI and Logan Paul however, have set up the whole thing and in doing so are creating a massive amount of money and misleading their fans. However, the biggest bit that upsets me, is that both KSI and Logan Paul – as well as their brothers who are also “boxing” one another – will earn more in one night, than most professional fighters will in their entire careers. That for me is hard to accept, as I have witnessed first hand how hard professionals train and I have seen how much they have to sacrifice. I’ve never fought professionally, but even on an amateur level you dedicate so much to the sport in terms of sacrifice, diet, training and your social life. Unfortunately, it seems that boxing is being used more and more by celebrities or by organisations as a means to make quick money, raise their profiles or try to improve their image. The sports authenticity is getting damaged and the fact that these “celebrities” can make millions in one night after a limited amount of boxing training, whilst genuine professionals struggle throughout their career to afford to live and feed their families… That does bother me! It would seem that several pro fighters and big figures in the sport have unfortunately got involved in this whole charade and whilst they may not see it the way that I do, I hope that one day they can see why this “fight” is in all honesty, a joke. It may be funny and it may be entertaining for some, but I hope that whatever money they do make, they invest back into the sport or into those less fortunate than themselves. I will always wish people good health when they’re getting in the ring and although this “contest” is far from professional I hope that both men come out of it OK and unscathed. However, I also hope that both men leave this sport alone once they’ve earn’t their next few million and from that point on, leave it to the real dedicated men and women who devote their entire being to the pugilistic art. 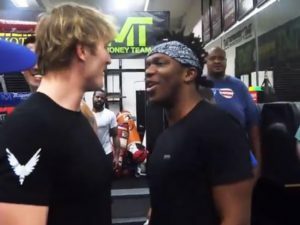 Posted in BOXING NEWS, COLUMNS BY TYLER "THE MIRACLE MAN" WHITE Tags: Why the KSI Vs Logan Paul “Fight” is a Farce!